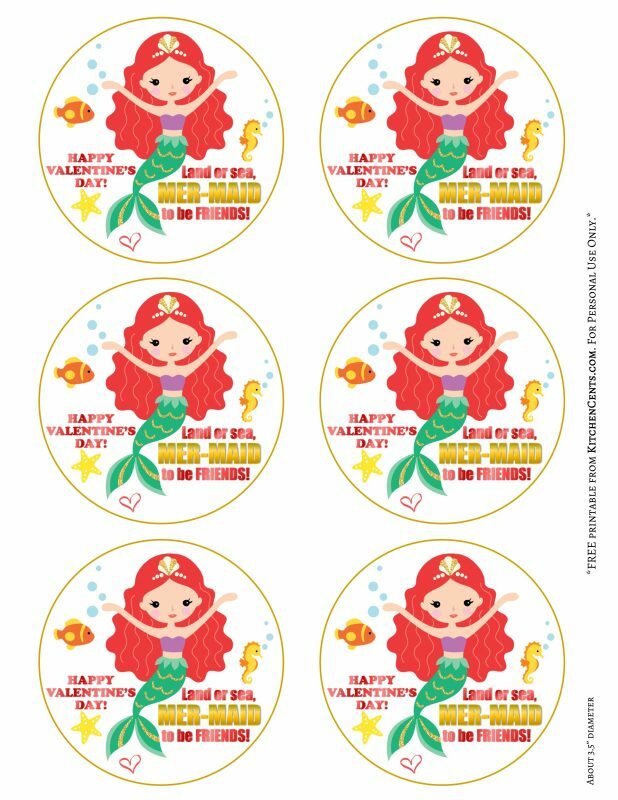 Mermaid Valentine Idea – easy non-candy valentine classmates will love. 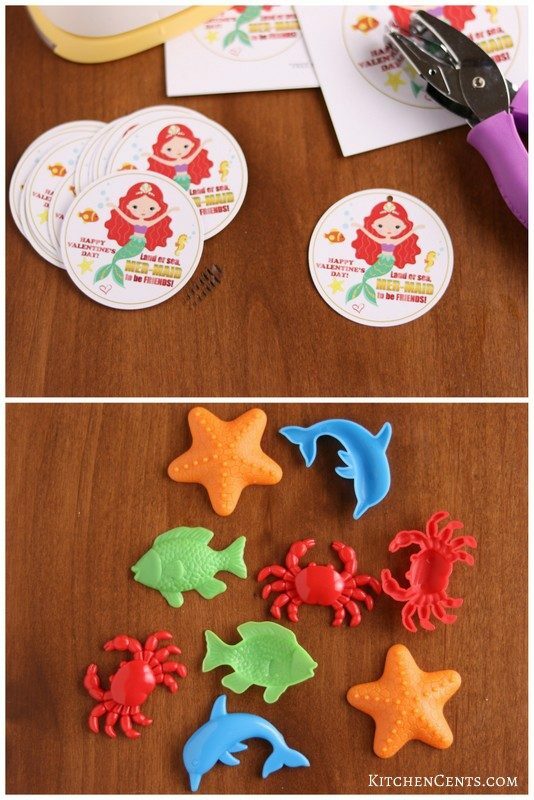 Made with no-mess magic play sand, mini sand toy and FREE mermaid printable (find the printable below). If you’re looking for a fun non-candy valentine all the kids will love, this is it! 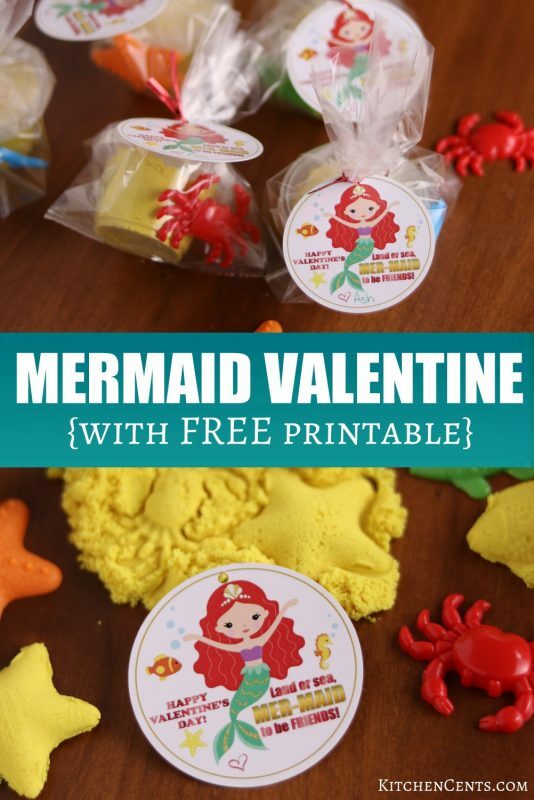 This easy no-mess Kinetic Sand Valentine with FREE mermaid valentine printable (PDF printable file below) is the perfect way your child can show their friendship and love to classmates this Valentine’s Day! 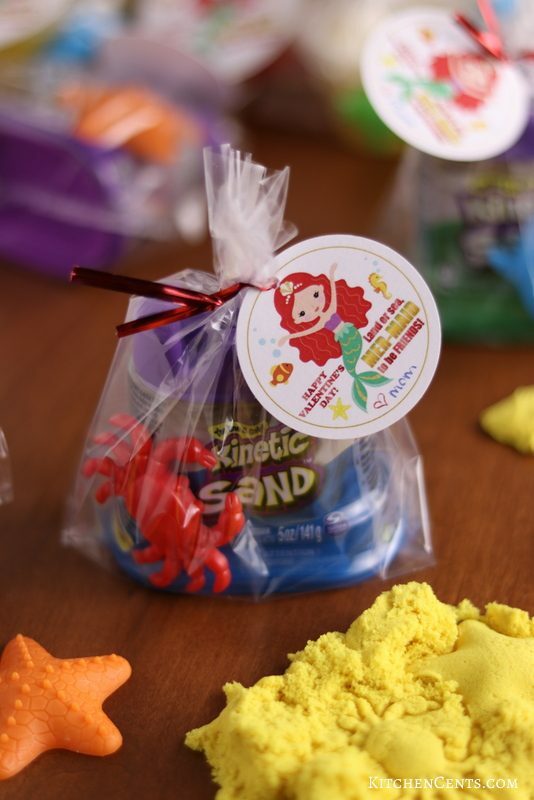 WHERE DO I FIND KINETIC SAND? I won’t lie, Kinetic Sand (the name brand stuff) is a little price. When you’re talking about making a valentine for each member of your child’s classroom, that adds up fast. I have two kiddos in school right now, one in preschool and the other in elementary. 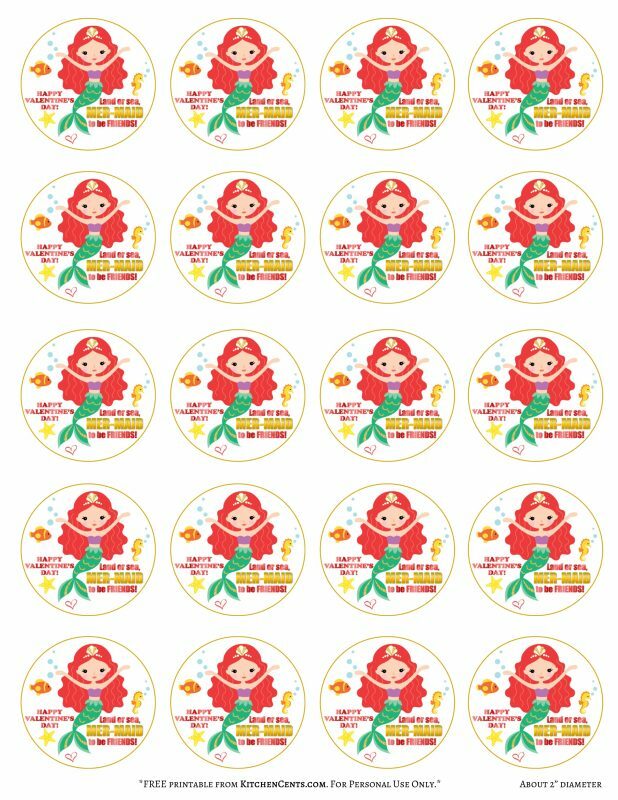 We needed 36 Valentines this year. 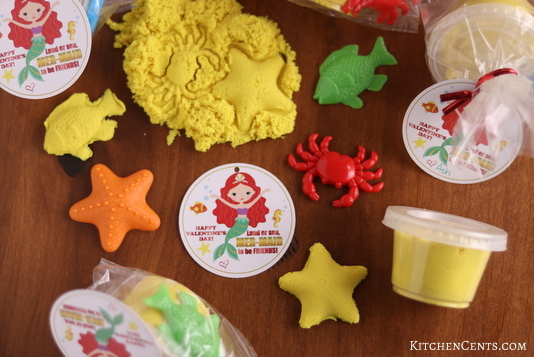 These small 5oz castle containers of Kinetic Sand are about $2 a piece. That would have cost me over $75 just for the no-mess sand! Ouch! 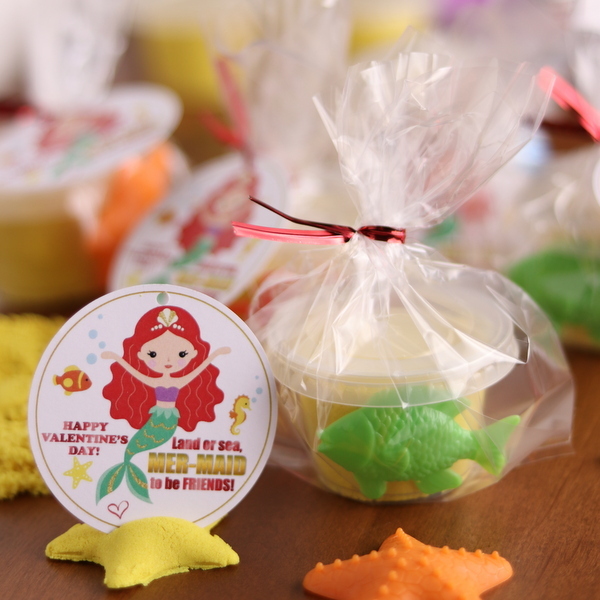 If the price isn’t an issue for you, feel free to use the 5oz Kinetic Sand containers to go with these cute mermaid valentine printables. You can find them on Amazon (here -more expensive) or at Walmart/Target (about $2 a container). I made 4 Kinetic Sand versions for my girls for Valentine’s Day. YES! For classmates, we went the more frugal way… I purchased the magic sand in a bulk bag. I actually found a 5.5lb bag of Sand Alive at a liquidation store about a month back for $6. CRAZY! 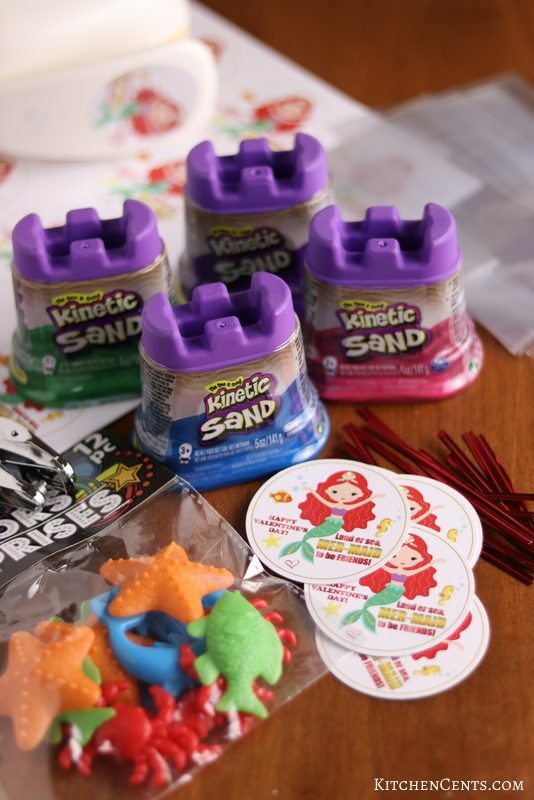 You can find large bags of Kinetic Sand or generic brand no-mess magic sand on Amazon and at stores like Walmart or Target for a reasonable price (under $15). I bought little 2-3oz portion cups from Dollar Tree. They came in a 10 pack for $1. I divided the 5.5lb bag of no-mess sand into those cups and snapped the lid down. 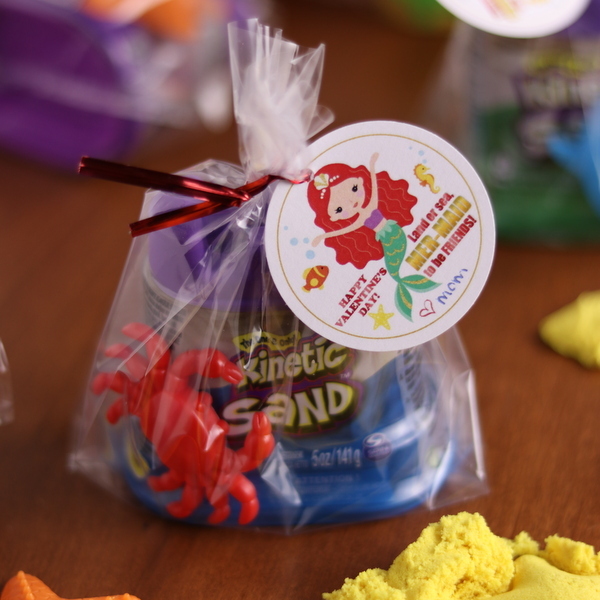 To add a special but inexpensive touch to this toy valentine, I added a sand toy and created a mermaid valentine tag to go with each sand valentine. I also found a pack of 12 mini sand toys at Dollar Tree. Aren’t they so cute! There are 3 sizes of tags; 2-inch (20 to a page), 2.5-inch (12 to a page), and 3.5-inch (6 to a page). 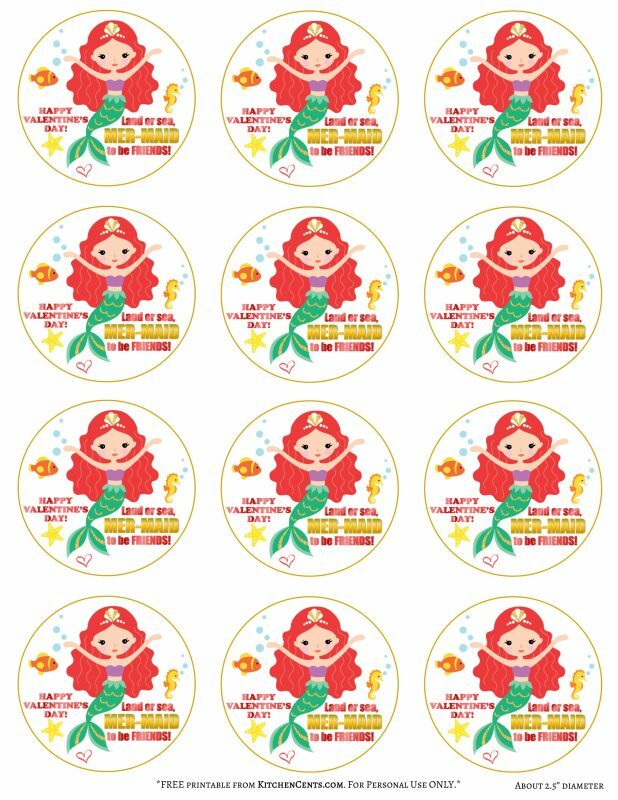 You can choose which fits your mermaid valentine best. I used the 2.5-inch and used a 2.5-inch round punch to quickly cut them out. You can find a round craft punch like the one I used here or you can save some money and check out your local Michael’s, JoAnns, or Hobby Lobby craft store. All of these stores usually have a 40%+ coupon you can use on regular price items. Click the size you’d like to print. It will open a PDF that you can then print. I hope you all have a sweet Valentine’s Day!